Back on the West Coast for the final three days in the States, my plans had to be revised, with the Shuttle arrival at LAX now put back a day, following the weather delay into Houston. Of the remaining places i still wanted to visit around LA, it wasn’t necessary to miss anywhere out, and was just relieved that the arrival at LAX was still going to happen within the next three days. That was the important thing! With the party on hold at LAX today, some of the other places of interest around the LA area were to be visited. First stop was Santa Monica, not far North of LAX, with the main interest being the DC-3 on display at the Museum of Flying here. Along with a statue of its designer, Donald Douglas, C-53 N242SM ‘Spirit of Santa Monica’ is mounted on poles at the entrance, and honours the home of the DC-3, that made its first flight here at the then named Clover Field in December 1935. Also on display outside at the museum, infact fixed to the side of the building, is the nose section of ex FedEx B727-277F N242FE ‘Brittney’. Santa Monica is a reasonably busy airport with a lot of GA and regular biz-jet movements, with a fantastic viewpoint being the Typhoon Restaurant (part of the main airport admin building), that has an elevated view over some of the ramps, the very close runway and across to the main biz-jet FBO’s and hangars opposite. This spot is good for photography until late afternoon, when the sun gets around. Probably frequented mostly by the more ‘regular’ US biz-jets (i wouldn’t expect anything ‘exotic’ here), present today were Falcon 2000 N278GS of GC Air, Gulf 450 N461QS of NetJets and Challenger 300 N723MC of Challenger Air Operations (previously D-BFLY & M-BFLY). From here it was the short distance to the CSC- California Science Center, for the return visit to photograph the DC-8 & TA-12 from the other side, in the great early morning sun. Not so great was the parking ticket… ‘I was only gone five minutes’! Then, heading South past LAX, next stop was Torrance ‘Zamperini Field’, the home of the Robinson helicopter factory. The ‘hair dryer’ was not the reason for the visit (with non even seen, not that i was looking hard), but the aircraft of the Western Museum of Flight. The museum was previously located at Hawthorne (close to LAX), but ended up here four years ago, and have been planning on a purpose built facility since. Thinking they were still at their temporary museum location here, i was surprised to see the aircraft displayed outside had now been relocated away to the very Eastern side of the airfield (close to the proposed new site). Now difficult to photograph, unless you are airside, a nearby car service center has an ideal photospot, looking down from the roof of their little multi storey car park! Only problem is, only two of the three aircraft are ‘on’ for a shot, with the star parked behind… YF-23 87-0801. The ‘Black Widow II’ was the Northrop entry for the ATF- Advanced Tactical Fighter competition in the early 1990’s, which of course lost out to the YF-22, now F-22A Raptor. Only two YF-23’s were built, with this one known as aircraft PAV-2 (PAV-1 is at Wright-Patterson), and is often complemented on as a great looking, sleek, futuristic design, that was apparently faster and stealthier than the YF-22, though larger and less agile. Another Northrop prototype here is the first YF-17A Cobra ‘201569’, which similar to the YF-23, lost out to a competitor, but then redeemed itself by winning a subsequent competition. Firstly, losing out to the YF-16 in the LWF- Lightweight Fighter programme for the USAF, both aircraft were then evaluated for the US Navy’s VFAX- Naval Fighter Attack Experimental project, with the modified and renamed ‘F-18 Prototype’ prevailing over the F-16N version. Again, two YF-17A’s were produced, with the second (that appeared at Farnborough and Paris in 1976/77) now on display at the USS Alabama in Mobile, AL. Finally, the third aircrat is US Navy F-14A 159830/NE-201 of VF-2 ‘Bounty Hunters’. So, a shame not to shoot the awesome ‘Black Widow’… a reason to go back one day… one other aircraft on the airfield that did get worked, was nice old Falcon 10 N127WL of CSDS Aircraft Sales. Looking in good condition, this vintage 1974 aircraft was the 16th production Falcon 10, and maybe should be in a museum itself! Heading East, next stop was the first visit to Long Beach… think Globemaster and Gulfstream. The ideal time to visit here is in the afternoon, for the best photospot (more on this later) after the sun gets around. This was just a quick look while passing through, with no C-17A’s photographed during this visit, as shots quite difficult unless they are flying. A few were present outside at the Boeing production facility, including at least one older aircraft on maintenance. Also present was executive B767-200 N767MW of MLW Air, here on a four day visit from its home at Dallas Love Field, before departing to Boeing Field. One of the oldest B767’s flying, this nice all-first class charter aircraft is often used by sports teams etc, aswell as for the more usual corporate flights. Gulfstream also have a large completion/service facility here, on the passenger terminal side of the airfield, with new pre-delivery aircraft flown in from Savannah in primer. Again, driving around the perimeter, there are no ideal spots to photograph these from, unless they are flying. One nice aircraft i did manage a distant shot of today, was Gulf 550 B-8256 in ‘Hanergy’ colours & titles, which is still registered to Gulfstream as N948GA (5348). Behind this was Gulf 550 N757GA (5357), also registered to Gulfstream and reportedly also bound for China, still just painted all white. Another Gulfstream photographed, at an FBO, though hardly new, was thirty year old Gulf 3 N711EG of Entrepreneurial Asset Management, along with a couple of Phenoms… Phenom 100 N583JS of JetSuite Air and Phenom 300 N585TV of Issue V Inc. Also, resident here are a nice pair of DC-3’s belonging to Catalina Flying Boats, with active DC-3C (VC-47D) N403JB and wfu DC-3C (C-47J) N2298C. The friendly staff with the company allowed me airside to photograph the pair, telling me that N403JB fly’s daily cargo and mail to and from Catalina Island (about 40 miles South off the coast), while N2298C looks in good condition, though minus outer wings and engines, reportedly awaiting restoration. From Long Beach it was on to Santa Ana, Orange County, otherwise known as John Wayne Airport, for the rest of the day, with an airport hotel booked. Aswell as being a very busy airport for executive movements, with probably as many as airliner movements, another draw here is the Lyon Air Museum. With the light getting better in the afternoon for landing shots, the museum was visited first, while the sun was still overhead. What a place this is… you’ll find it hard to find a more modern, immaculate facility than this, thankfully with good AC, after getting out of the heat. A bit of a ‘rich man’s toy’, the museum was opened in December 2009 by owner Major General William Lyon, who was Chief of the AFRES in the 70’s and made his money in real estate. Sharing the premises with co-owned FBO Martin Air (who most of the museum aircraft are registered to), the raised walkway inside offers a chance for some great shots, with some of the aircraft being airworthy and occasionaly appearing at airshows etc. Highlights here for me are a pair of nice DC-3’s, with DC-3C (C-47A) NC16005 looking great, restored into American Airlines colours as ‘Flagship Orange County’, and DC-3C (C-47B) N791HH restored into USAAF 97TCS/440TCG D-Day markings as 44-76791/W6-L ‘Willa Dean’. This was last operated by the Israeli AF as 4X-FND, from 1967 until being retired and flown to the States in 2000, spending a few years up in Ephrata, Washington before arriving at Chino in 2008 for restoration and display here. Also present is B-17G N9563Z, restored into USAAF markings as 297400/K-E ‘Fuddy Duddy’, which was previously used as a VIP transport (carrying General Eisenhower), before commercial use as a water bomber, being last used by Globe Air as ‘Tanker 89’ out of Mesa-Falcon Field until 1985. Another WWII bomber present is TB-25N NL25GL, restored as USAAF B-25J 44-29465 ‘Guardian of Freedom’, along with slightly younger A-26B N34538, restored (with an A-26C nose) into black USAF Korean War era 44-34538 ‘Feeding Frenzy’. Actually operated by the French AF in the Far East, the aircraft was later sold commercially and converted to a ‘Consort 26’, being opertated by the Hughes Aircraft Co (and flown by Howard Hughes), including for missile sensor flight tests when it was fitted with an extended radome. Finally, two ‘visiting’ aircraft present as temporary exhibits, were Cessna L-19E N4583V, restored as Vietnam-era US Army O-1E Bird Dog 0-24729 of 183RAC ‘Seahorses’, and TA-4J N518TA of Pacific Aero Ventures, restored into US Navy markings as ‘NP-518’. Flown again in April 2010 after a five year restoration by Fighting Classics at Avra Valley, the aircraft was rebuilt using sections from different aircraft, with front end (and engine) of TA-4J N518TA (ex 158486) mated onto the rear fuselage of A-4L N220AT (ex 149540) and wings from A-4L N215AT (ex 148602), all being from a batch of 36 aircraft sold to the R Malaysian AF, left behind at AMARC for spares use. The eagle-eyed will notice the ‘McDougall Douglas’ logo on the dorsal fin, in honour of the guy who rebuilt the aircraft, Mike ‘Maj’ McDougall, and can apparently be snapped up for around $6 Mil. A small but sweet museum, another nice touch are the large windows that look out onto the Martin Air FBO ramp, with the close runway and terminals opposite. Photographed from here, parked right outside, was a rare Beech 2000A Starship N8244L of Aircraft Partner 4U, along with CL601-3A N144BG (ex N144BS) of Monte Carlo Associates, and Cessna 650’s N406CJ and N384EM of WWF Air. And so, after a fairly busy day so far, the rest of the afternoon was spent relaxing, taking landing shots here at John Wayne. A good photospot in the afternoon, when landing from the North onto Runway 19R (which is common), is the parking lot of the industrial estate on the NW perimeter (right next to the San Diego Freeway), though a bit of discretion may be needed, with occasional police patrols. Another airport dominated by Southwest, with a handfull of other US short haul regulars… Alaska B737’s and an AirTran B737 & Frontier A320 were about as exciting as it gets here for airliner movements. Having said that, three weeks later Mexican operator Interjet commenced daily A320 services! One Southwest special today was N781WN ‘New Mexico One’ arriving just before sundown, following the two regular cargo movements here… UPS B757-200F N472UP on UPS9086 from Phoenix and FedEx A300-600F N667FE on FDX1383 from LAX. The latter is the only scheduled widebody service here, making the short ten minute hop from LA before loading up for Memphis. Executive arrivals over the five or six hours until sundown then, were... P-180 Avanti N137SL of Avantair, Cessna 525 N417Q of KM Aviation, nice 30 year old Gulf 3 N557JK fitted with hush-kits, even older sleek Beech B60 N420JD fitted with winglets, arriving from Casper, WY, Phenom 100 N579JS of JetSuite Air, Beech B200 N97WC of West Coast Aviation from Santa Barbara, Gulf 4 N1AM of Alise Aviation from Las Vegas, CL601 N169TD, QS3 hush-kitted Gulf 3 N19H of HBI Leasing from Van Nuys, early Cessna 510 N4FF of Zita Acquisitions from Oakland, Cessna 650 N184GP from Monterey, Cessna 550 N16PL of Modern Development Co from Paso Robles, Falcon 900B N721HM of Gamma Charters/Blue Horizon Management as GAJ721 from Van Nuys, Beechjet 400A N710RA of Regency Air from LAX, CL604 N203R of Raytheon Co, 1979 vintage AC690B N107GL of Western Eagle Express, Gulf 3 N598GS of Centralize Leasing Corp from Tampa (previously JY-HZH of the Jordanian Government), CL605 N605RC of Rockwell Collins, Cessna 525B N87VM of Swift Properties from Santa Maria, Phenom 100 N582JS of JetSuite Air and Gulf 4 N999GP of GEP Air as PEG99 from Des Moines, IA (previously F-GPAK & HB-IWZ). Another early start and straight back on the highway to LAX, getting there in plenty of time for the big day ahead. The original plan was to charter an R22 out of Hawthorne for a photo flight over LAX, to shoot Endeavours arrival. However, with a couple of weeks to go the FAA imposed a TFR (airspace restriction), meaning the flight would not be possible. This was expected in the end, so a back-up plan of reserving a spot at the Proud Bird Restaurant had been made, for probably the best public photospot possible. Naturally, a lot of planning had been made for this day, and it was known the arrival would be made on one of the Southern runways (25L or 25R), rolling out towards the United ramp and hangar where they would park, and after de-mating where the Shuttle would live for the next three weeks. Concluding the story… ‘Astro 95’ B747-123SCA N905NA with Space Shuttle Endeavour (OV-105) was wheels up off Edwards AFB at 0817 today, for the last ever Shuttle ferry flight, escorted by a pair of NASA Dryden F/A-18B’s, N846NA & N852NA. The departure time was put back an hour for the expected morning fog to clear over San Fransisco for their flyover, with the grand tour of California to last around four and a half hours, before touchdown at LAX. After departure from Edwards and flypasts of nearby birthplace, Plant 42 at Palmdale, the route was North to State Capitol, Sacramento. Continuing West to the San Fransisco Bay area, then South past the NASA Ames Research Center at Moffett Field, the route followed the coast down to Vandenburg AFB, NASA’s Jet Propulsion Lab before on to the LA area. Famous landmarks then flown past included Malibu, the Hollywood Hills (and the famous sign), its future home at the CSC, Disneyland, the Griffith Observatory, the Queen Mary at Long Beach and Universal Studios. During this time, the first fly-by at LAX was done, with a low overshoot along the Northern Runway 24R at 1205, before heading off again for half an hour. Before the final moments, looking around, you could see people stood on the top of almost every building in sight, and nearby highways coming to a standstill with people getting out of their cars! And so, on return, a low gear-up overshoot was carried out along Runway 25R, to the now familiar excitement from the huge crowds, before back around… ‘gears down, she’s landing’, with a final approach and touchdown on 25R at 1251. What a moment… As previously compared to, if you were lucky enough to be one of the thousands at Heathrow around the final approach to runway 27R on 24th October 2003, you will have a good idea of how these rare, momentous events feel. If you need to be told, the occasion nine years ago was the final Concorde passenger flights, with G-BOAE, F & G on approach at the same time. Enough said. Getting back to 2012, LAX had held all aircraft movements for around 15 minutes for the Shuttle landing, with that half an hour period between the 24R overshoot and 25R overshoot providing a few more arrivals of interest… A320-200 N625VA of Virgin America, ERJ-145MP XA-HLI of AeroMexico Connect/Aerolitoral, a rare Gulf 350 N723MM of MGM Grand Hotels, B747-400 D-ABVU of Lufthansa, A330-200 D-ALPF of Air Berlin as BER7022 from Tegel and last but not least, nice BAe125-1000 XC-LNC (no other id info on this yet) thankfully just getting in before landings were stopped. Then, following the Shuttle touchdown, the plan was to get straight off to Long Beach, and after eventually getting onto the highway, managed to leave the chaos behind! Phew! This second visit to Long Beach was for the rest of the day, spent at the great afternoon photospot, in the large parking lot of the DeVry University and office blocks. This is close, and parallel to the main Runway 30, the most commonly used, with one of the taxiways VERY close to the perimeter fence. Infact, so close that Globemasters don’t use it (instead crossing over for the taxiway opposite). No problems it seems with security here, with others using the parking lot also not concerned with people taking shots. Infact, most shots taken at LGB are from here, with another guy stood on a pick up also here today. Aswell as ‘30, Runway 25L is also worth monitoring, being favoured by the returning DC-3 on the regular Catalina Island run. The airline scene here is dominated by JetBlue, who have a hub (or ‘focus city’ as they call it), with six A320-200 movements in the 4.5 hours i was here this afternoon… N503JB, N565JB, N593JB, N621JB, N638JB and N793JB (no special schemes among that lot though). Others today were a single CRJ-900ER N916FJ of US Airways Express/Mesa Airlines from Phoenix, and single CRJ-700 N606SK of Delta Connection/Skywest Airlines from Salt Lake City. Highlights though are the Alaska Airlines/Skywest CRJ-700’s that serve Portland and Seattle, with N216AG and N218AG photographed this afternoon. The ‘big two’ cargo carriers also have schedules here, with UPS B767-300FER N350UP (delivered new six months ago) as UPS2916 from Louisville, and FedEx A300-600F N673FE as FDX1351 from Houston IAH. Cargo highlight though was catching the classic Catalina Flying Boats DC-3 (VC-47D) N403JB returning home, which as usual used Runway 25L for landing, rolling out towards their ramp. As you would imagine, the C-17A flights here are not 'that' frequent, certainly not daily, so you still might feel fortunate to catch one in the air. So, you might feel even more fortunate if its a ‘foreign’ aircraft, as was the case today. Following its first flight yesterday, the third Qatar Emiri AF C-17A N9500N/MAC (to be A7-MAC) flew a second test flight this afternoon (returning after dark). Finished in the regular military grey scheme, it was later delivered on 10th October. I later found out i had just missed another C-17A movement though, with USAF 437AW 95-0107 ‘Charleston’ (seen yesterday) departing for home after upgrade at the MOD Center here. The Gulfstream completion/service center provides a lot of the interesting biz-jet movements here, with i think just the one today… MGM Grand Hotels brand new Gulf 550 N721MM (5370) departing to LAX. In the same colours as their other aircraft (including their Gulf 350 N723MM just photographed at LAX), N721MM was previously used on a Gulf 5, now registered in China. Also photographed today was 1997 built Gulf 4SP 9M-ABC of Flightplan Jet Club, preumably here for servicing, being towed out of the Gulfstream facility to a remote spot (for engine runs?). Those visiting Zurich for the WEF over the years may have seen this aircraft present, until recently in an all pale blue colourscheme. Behind this today was another new Gulfstream awaiting delivery, with N753GA (5372) painted with a company logo on the fin (to be N999FH), which had carried out a test flight a week earlier. Also visible around the facility was Gulf 4 HL7222 of Korean Air, Gulf 550 B-90609 of WinAir and new Gulf 550 N593GA (5393) still in primer. One other Gulfstream movement this afternoon, departing from an FBO ramp, was Gulf 4SP N2107Z of Air Prestigio, with other biz-jets photographed today… Cessna 525B N28DM of Machavia, Cessna 525B N300ET of Aviat LLC, Cessna 560XL N560L of Lozier Corp as EJM56 from Austin, TX, Cessna 750 N758CX of Oxbow Aviation, Gulf 150 N501RP of Penske Jet and very smart Global Express N77UF of F&L Aviation arriving just before sundown. Finally, the LA County Sheriffs Dep have a large base here with very busy helicopter movements. Highlights of these smart green and gold choppers are the vintage S-61B’s, with three of the ex US Navy SH-3H’s still in service, and N950SB ‘Rescue 5’ photographed on return to base today. The LASD is the only law enforcement agency to use these (with N950DG being the S-61B that famously flew Michael Jackson’s body from the hospital to the coroners office after his death), though not for much longer, with the first of three AS332L1 Super Puma’s (N950SG) arriving a few weeks later as their replacement. Following the final night in a hotel near LGB, todays plan was to head North to visit the final few places on the itinerary, before ending up back at LAX for the flight home to the UK. First stop was Burbank-Bob Hope, arriving at sun up in time to catch the first departures of the day preparing to taxi. An ideal spot was quickly found at the perimeter fence close to the taxiway and main Runway 15, as a couple of nice suprises were about to appear from around the corner. First was B737-700 N607AS of Alaska Airlines, the green ‘Portland Timbers’ logojet, followed by A320-200 N605JB of JetBlue, the ‘Boston Red Sox’ logojet. In the space of 20 minutes, six airliners had departed, with the other regulars including Southwest B737-700 N418WN named ‘The Winning Spirit’. Then, having a drive around the rest of the airport, highlight here is B727-200 N686CA still in full Champion Air colours. Now registered to CSDS Aircraft Sales, it has been parked in the same spot here for several years now. Opposite, on the SW corner of the airport is the Ameriflight base, with around a dozen of their small, cargo twins present. A request to photograph them airside was denied, but i still managed to get a few shots from the fence… Beech 1900C-1 N26RZ, Beech C99 N204AF and two Pa31-310’s N6759L & N7441L. Finally, one biz-jet photographed (of a few present) was Astra SPX N307JW of Pacific Ridge LLC. From here it was the short distance to Van Nuys, and being a Saturday the place was pretty quiet. A look around the side roads, FBO’s and hangars along the Eastern perimeter found a few very nice old biz-jets present, including three B727’s... 1967 built B727-021(WL) VP-BAP of Malibu Consulting (in great condition), 1967 built B727-021 N727AH registered to Classic Designs of Tampa Bay Inc (reg expired March 2012, but looking in good condition), and 1966 built B727-051 N724CL registered to Clay Lacy Aviation (paint looking a bit tatty, with no reg visible). These last two may well be retired, along with a few old Learjets parked around the latter, including a pair of vintage 1968 aircraft photographed… Learjet 24 N664CL also registered to ‘aviation hall of famer’ Clay Lacy, and Learjet 25 N726WR (007) of Montreal Aviation Assets. Aswell as these, a couple of nice old Gulfstreams (both still flying? ), were Gulf 2SP N264CL also of Clay Lacy, and Gulf 3 N304TS of Nomad Transportation. More recent, but reportedly stored here (for sale?) is ex-Delta Connection/Comair CRJ-200ER N489CA, now painted all white after being returned to Bombardier in 2007. Parked next to this was colourful Gulf 4 N269HM of Flynt Aviation, the all black personal ‘ride’ of Hustler magazine’s Larry Flynt. Also in this area, an old ‘x-plane’ can still be seen in an open hangar here, though the mystery and conspiracy theories about this thing are ‘old news’ now. Grob Egrett 1 N520EG (10003) registered to Gentran Corp, was developed around 20 years ago as a high altitude reconnaissance platform by Grob in Germany and E-Systems in the USA. Also known as ‘Senior Guardian’, the all-composite, single-seat long endurance aircraft has the one engine (with an 11ft prop) built onto a 108 foot wingspan, giving it a range of around 4,000km and an endurance of 13 hours, operating up to 50,000ft, with large bays along the underside for various sensors etc. Looking a bit like a Tucano on steroids, it sounds impressive… well, it was cancelled… or was it! Further along the Eastern perimeter is the official viewing area here, at the end of Waterman Drive, which being on the East side is good for photography until around mid-day, with a taxiway very close and main Runway 16R not too far away (with 16L ‘tin’ runway closer). From Waterman, the ramps at the NE corner of the airfield can be viewed close by, with L-39C N139CK ‘62 White’ in brown ‘Soviet AF’ camo with a ‘Transformers’ logo parked here, and Cirrus VK-30 N52TH which taxied out and departed. This is well known as being the first Cirrus aircraft built, with a quite radical ‘pusher’ design, that led to the more conventional SR-20 & SR-22 production designs. The final ramp, in the North East corner, contains the water bomber base, with two Government of Quebec CL-415’s on detachment for the fire season… C-GQBI/246 and C-GQBK/247 being loaned to the LACFD for 2012, following regular contracts over the years. Parked with these was an Erickson Skycrane, though not being able to get a shot, i can’t recall the reg… however, similar S-64E N176AC/733 ‘Lucille’ was parked in the usual spot, across the runway on the LACFD Air Ops ramp. Other, active choppers photographed here today were… S-70A Firehawk N160LA/16, AW-139 N302FD ‘Fire Attack 2’ (recently replaced a Bell 412 with the same reg) and Bell 412EP N304FD/4, with S-76B N615D of the Childrens Hospital LA/Helinet Aviation also arriving. Parked nearby was vintage Gulf 2B N477GG, which is wfu after the reg expired a year ago, while biz-jet movements today were… Cessna 650 N831GA of TP Air, Gulf 4 N368AG of Blue Sky Group (in a nice colourscheme with a large black shamrock on the fin), Gulf 4 N77WL of Martin Aviation (as the reg implies, the personal ride of William Lyon, of the Lyon Air Museum at John Wayne) and 30 year old Cessna 550 N510GP of F&M Aviation. Finally, a couple of ‘warbirds’ on weekend jaunts were 1983 built L-39ZA N403ZA of Pristine Warbird Holdings and one of the resident SNJ-4 Texans, 1956 built N86WW/42/HL-B of Tailwind Aviation. From here, the last stop of the day before returning to LAX was a library… yes, a library. But no ordinary library, this one is located in Simi Valley (around 40 miles NW of LA) off the Ronald Reagan Freeway. If you don’t know by now, the Ronald Reagan Presidential Library is the final resting place of the 40th President of the US, and set on top of a hill overlooking the rolling valleys around, is a spectacular and fitting location for one of the greatest leaders. And what an amazing building, with everything you could possibly want to know about Ronnie, aswell as many exhibits relating to his life… including his old ‘Air Force One’! USAF VC-137C 72-7000 is on display inside the largest building in the complex, the Air Force One Pavilion, and is open to the public. Operated by the 89th AW at Andrews AFB, ‘Twenty Seven Thousand’ served seven Presidents, from Nixon in 1972 to Bush in 2001, with its final ‘Air Force 1’ flight to Waco, TX on 29th August 2001, before being retired and flown to San Bernadino in the September. From there, it was dismantled by Boeing engineers and taken by road to Simi Valley, in what was known as ‘Operation Homeward Bound’. Following construction of the building, it was reassembled and fully restored to an immaculate condition, raised on 25ft pedestals above the ground. Accessible from the second floor, the cockpit is powered up, while the cabin is set out exactly as it was, with many artifacts onboard, right down to the chocolate cake Ronnie used to like! Unfortunately though, no photography is allowed onboard. As well as this, two other aircraft are on display, with ‘Marine One’ VH-3A 150611 operated by HMX-1 from 1966 to 1975 (when replaced by the VH-3D) on display on the ground floor, next to the VC-137C, while outside is US Navy F-14A 162592 painted as ‘AJ-102’ of VF-41 ‘Black Aces’ (with an Su-22 kill mark on the fin). Previously marked as ‘AJ-101’ (i guess in error), this represents 160403/AJ-102 (the real one currently being restored at Midland, TX) which was involved in the Gulf of Sidra incident, off Libya in 1981, when it returned fire and shot down the first of two Libyan AF Su-22’s. This followed Reagan’s order to deploy a large naval force to the region (including carriers USS Forrestal & Nimitz) for FON- Freedom of Navigation operations around disputed waters off Libya. And so, heading back to LAX, there were two places there that i wanted to visit at the end of this trip. The first was a return to the Proud Bird Restaurant, to photograph the DC-3 in Western Airlines colours, and then on to the second DC-3 resident at LAX, where one final big surprise was also waiting. The Flight Path Learning Center & Museum is on the Southern perimeter at LAX, just below the popular photospot at Imperial Hill. Infact, Flight Path is also a good photospot for Runway 25L/R movements from their facility on the edge of the ramp there (open Tue-Sat 1000-1500). On display on the ramp here is DC-3-362 N760 ‘Spirit of Seventy Six’, which was previously on display at the Western Museum of Flight when at Hawthorne, and is now here on loan from the CSC- California Science Center. N760 is actualy a fake registration (which is currently on a Falcon 900EX), really being ex NC1944 when operated by TWA, until 1956 when taken on by the Union Oil Company (Union 76)… hence the ‘N760’ and ‘Spirit of Seventy Six’. The staff here kindly agreed to open the aircraft, to see the nice seventies chic inside, still as it was when operated by Union Oil as an executive transport. The big surprise then?... and also a very big surprise for the Flight Path staff, was NASA B747-123SCA N905NA, which following the de-mating of Endeavour, had been towed across and parked right in front of the DC-3 today! As you can imagine, they were having a very busy day with a lot of visitors at the Center, as word got around and passers-by saw it parked here. This one final chance to see and photograph the SCA up close, one of the oldest B747’s flying, looking great in the California sun, was a fantastic and fitting end to a great trip. Two days later, the aircraft returned home to NASA Dryden at Edwards AFB, on what was widely reported to be its final flight. Despite many ‘reporters’ repeating this story, it still didn’t make it true, and at the time of writing the future of the aircraft is still not confirmed! What is known, is the aircraft later flew from Edwards to Ellington Field as NASA905 on 24th October, landing at 1408 on what MAY have been its final flight. To quote the official NASA website, ‘a decision on its future use or retirement is still pending’ and the aircraft ‘will be retired and eventually placed on public display’ at Ellington. 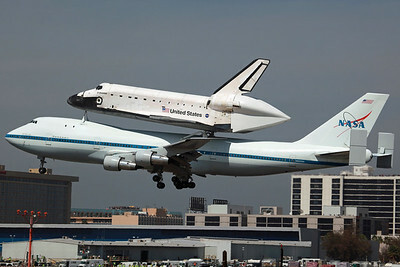 With both B747SCA’s actually ‘owned by the Johnson Space Center’, it makes sense that NASA905 would be flown to Houston for display, and if so, would certainly be of great relief to the many people who believed the reports that it would scrapped for spares. As previously reported, the other B747SCA, NASA911 certainly remains parked at Palmdale as a potential source of spare parts for B747SP SOFIA N747NA, so hopefully 905 will indeed be left intact and put on display. Time will tell. Ironically, after all the furore about Houston not receiving a Shuttle for display, they may just have grabbed the next best thing. Now, if only they could get Enterprise back from New York to sit on the top! Finally, of all the facts and stats on Endeavour, i’ll save the best ‘till last… The fifth and final Shuttle was built as a replacement for Challenger, with production commencing in 1987, using spare parts made during construction of the two previous Shuttles. Rolled out at Palmdale in April 91, the first of 25 launches was on STS-49 in May 92, with the last on STS-134 in May 11, being the penultimate Shuttle mission. Seven landings were made at Edwards AFB to conclude the space flights, then requiring the ‘lift home’ back to KSC on a B747SCA. As for the name, Endeavour was chosen after a national competition, being named after the British HMS Endeavour, the ship which took Captain James Cook on his first voyage of discovery in 1768. Cook… born in Marton… a Boro boy. Enough said! N905NA B747-123SCA NASA Dryden with Space Shuttle Endeavour. Arriving as Astro 95 from Edwards AFB, on the last ever Shuttle ferry flight. LAX 21/9/12.